55 yo male with headache and vomiting. 1. 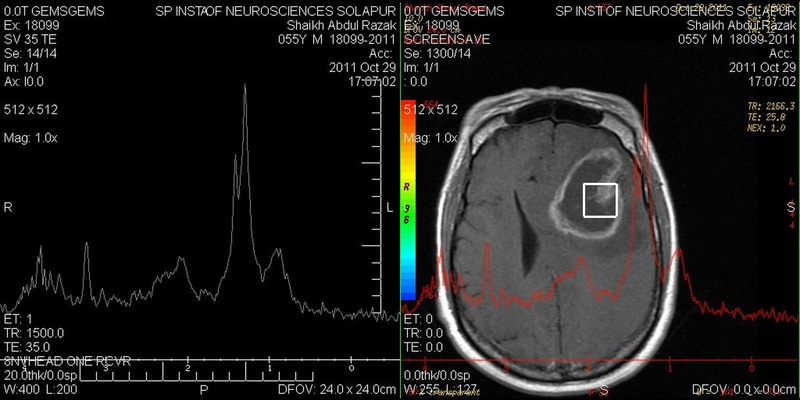 An intra axial space occupying lesion in left frontal lobe white matter. T2 iso intense thick enhancing wall with T2 hyper intense central non enhancing necrosis. An enhancing T2 iso intense eccentric nodule. T2 hyper intense Perilesional vasogenic odema. Dw images show high signal along the thick wall. No restricted diffusion in the region of central necrotic core. Faint low signal along the wall on T2*GRE represent hemosiderin staining. 2. Another separate similar signal intensity but smaller fainly enhancing bubbly lesion involving corpus callosum extending in right lateral ventricle. 3. Significant mass effect. Left lateral ventricle compressed, significant mid line shift with mid brain compression. 4. MR Spectroscopy, a 2x2cm voxel placed over the nodular portion of lesion, spectral waveform obtained at short TE of 35 ms. Sharp doublet of lactate at 0.9 to 1.3ppm, short peaks suggestive of markedly reduced NAA at 2.02ppm and creatinine at 3.02ppm. sharp long peak of raised choline at 3.03ppm. raised choline - creatinine ratio. 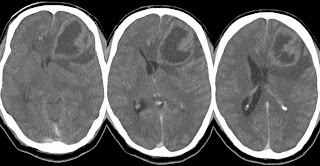 Imagingwise diagnosis : Multicentric Glioma and Abscess. 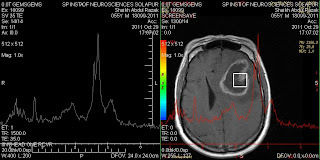 Absence of restricted diffusion, thick enhancing wall with eccentric nodule goes more in favour of Glioma over abscess. Histopathology report : Glioblastoma Multiforme. GBM, a grade iv glioma, most common primary brain tumor, ~12-15% of all intracranial neoplasms, ~50-60 % of astrocytoma, multifocal in upto 20% cases.